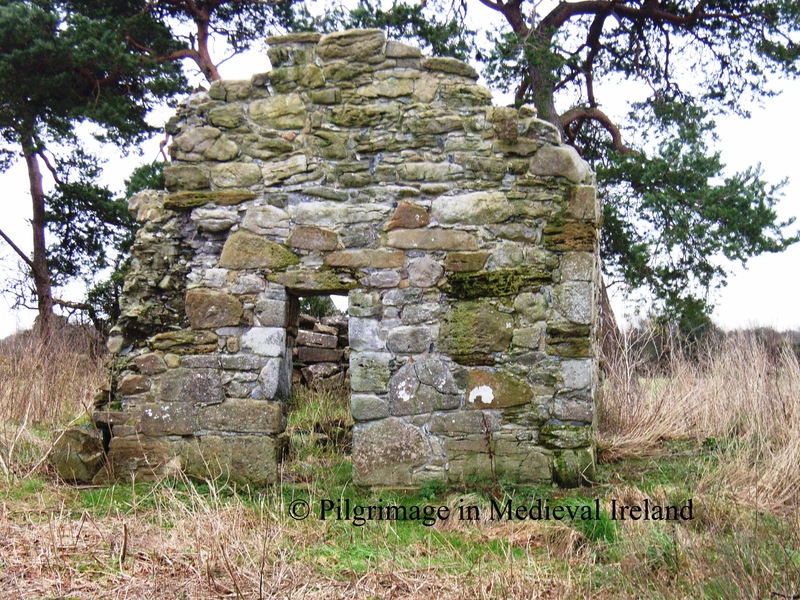 The ecclesiastical settlement of Lemanaghan is one of Co. Offaly’s hidden treasures. There is so much to say about the architectural remains and the history of the site and of course its founding saint, Manchan. 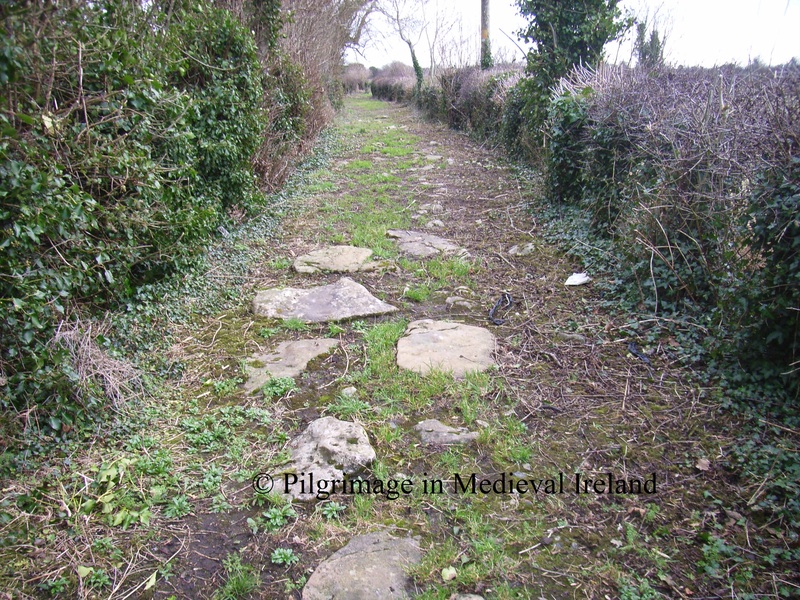 I am going to focus on the evidence for medieval pilgrimage at the site . In early medieval times Lemanaghan was located in the territory of the Delhna Ehtra tribe close to the border of the territory of the Delbna Ethra and the Ferceall. For the modern traveler it is located along the R436 to the east of the town of Ferbane. Lemanaghan was founded in the 7th century after King Diarmaid son of Aedh Sláine, granted the land of the territory of Tuaim-nEirc (Doimerc) to Clonmacnoise following his victory at the battle against Guaire King of Connaught in 645/646. 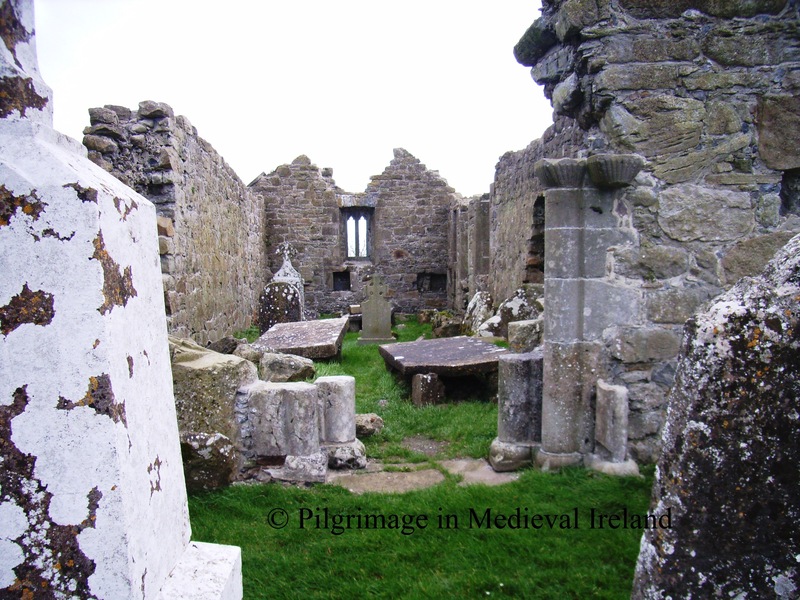 It appears that Manchan a monk of Clonmacnoise, founded a sister monastery here at Liath-Manchain ” the grey place of Manchan” (Lemanaghan is the anglicized version ). There are a number of traditions concerning the geneology St Manchan. One tradition suggests he was a member of the Ulaidh of Ulster while another suggest he a was a member of the Eoghanachta of Munster and another that he was from Wales. The saint was credited with writing many poems during his lifetime . Manchan is also associated with the Mohill in Co Leitrim where local tradition holds he founded a monastery here before heading to Lemanaghan. Manchan died in 664/665 having caught the yellow plague that raged through the country. This is the same plague which killed St Féichín of Fore. Standing on a low swell, an armlet of well-reclaimed bog, it gently rises above the extensive moors with which it is almost surrounded. This doesn’t mean the Lemanaghan was isolated from the rest of the world. It was linked to other settlements in the area in particular Clonmacnoise , and the wider world through a series of bog roads and tracks . Excavations carried out in the surrounding landscape have identified several roads and tracks many dating to the 6th and 7th centuries when the monastery was founded. The excavations also show that roads and tracks were being built and repaired around Lemanaghan up to the 17th century, suggesting it was a focal point in the landscape throughout the medieval period. Thus its location was not a barrier to pilgrims and visitors. Little physical evidence remains of the early monastery with the exception of a number of early medieval cross slabs ( two of which are found with St Manchan’s church and ten others housed in national school), a large bullaun stone (beside the holy well) and a holy well dedicated to St Manchan. The annals list the names of several abbots of the monastery ( in the years 717, 767, 792, 853, 893, 1205). The fortunes of the monastery declined in the later medieval period. By 1302-6 Lemanaghan became a parochial church. The papal taxation records, record that there were no returns from the vicarage of Lemanaghan as it had been ‘laid to waste by the ravages of war’. St Manchan’s Church continued in use probably until 17th century and by 1682-5, the church was recorded as being in a ruinous condition, with church services being held in a nearby house. The main monastic complex was located at the site of the modern graveyard. All that remains today of this once vibrant monastery are two structures called St Manchan’s church and St Manchan’s house. St Manchan’s church was built-in two phases, the west end dates to the 12th century. Further building work was carried out in the 15th century at the eastern end . The western end of the building is the oldest with traces large limestone blocks in its lower walls and a large Romanesque doorway of 12th century date marks the entrance in west gable. A round-headed Romanesque window also survives. Little remains of the second structure called St Manchan’ house, with only the foot prints of the foundations visible, the Archaeological Inventory of County Offaly suggest that it is likely contemporary with the 15th century section of St Manchan’s church. 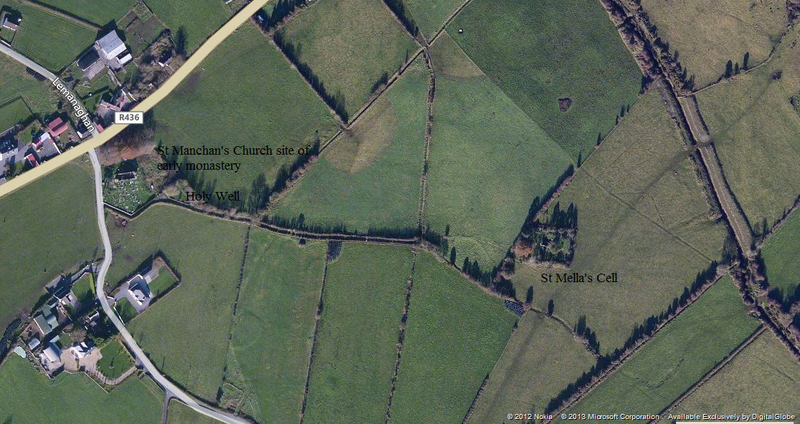 A third church known as St Mella’s cell, is located approximately 350m to the east. The site is connected to the main monastic centre by a narrow paved causeway. Local folklore recounts that depressions visible in the surface of the paving stones of the causeway were caused by the saints cow. St Mella was Manchan’s mother and tradition suggest she live here as an anchorite. The present church may have been built on the original cell. St Mella’s cell is quiet small measuring 5.5m x 3.1m internally. The walls are 0.8m thick and constructed of large what look like really large cut stones. These stones are in fact thin slabs set on edge in the manner of facing stones and the core of the wall is filled with stone rubble. 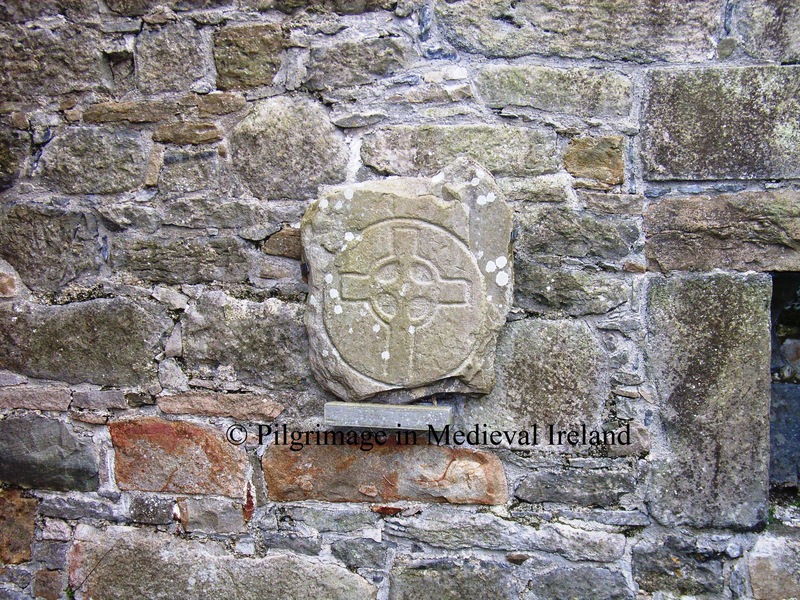 This type of building technique is common in pre-Norman Irish church building. The church is surrounded by its original rectangular-shaped enclosure (43m E-W by 35.5m north-south). 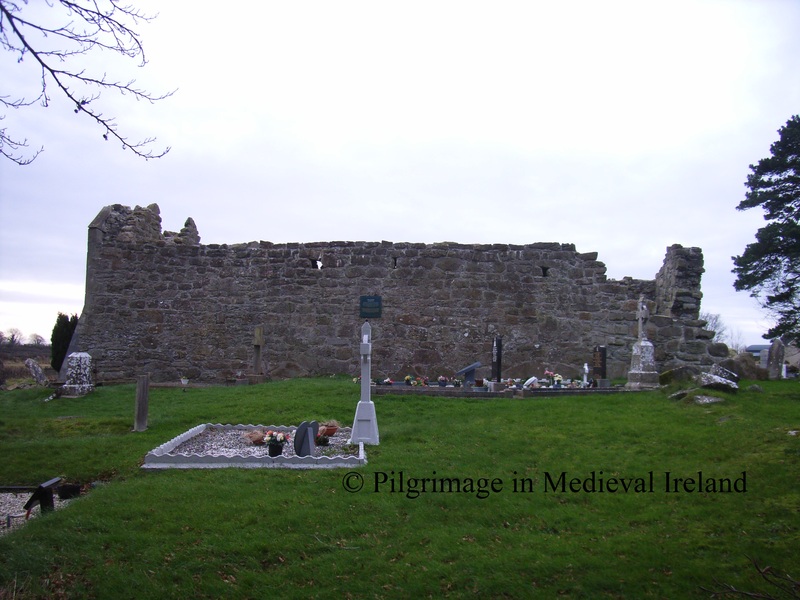 So what can we say about pilgrimage at Lemanaghan in medieval times? Pilgrims came here to venerate St Manchan and the anniversary of the saints death on the 24th of January would have had a special appeal for pilgrims. Pilgrims probably first began coming here following Manchan’s death. Given Lemanaghan proximity and close connections to Clonmacnoise, the site likely attracted pilgrims heading to Clonmacnoise and to other sites such as Durrow and Rahan, acting as a secondary shrine. Manchan was probably buried here we have no way of knowing if the saints grave had an appeal for pilgrims. 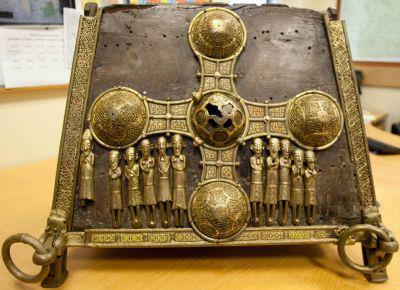 From the 12th century onwards a reliquary known as St Manchan shrine would also have attracted pilgrims. The shrine of Manchan, of Maethail (Mohill), was covered by Ruaidhri Ua Conchobhair , and an embroidering of gold was carried over it by him, in as good a style as a relic was ever covered. This reference likely refers to the Lemanaghan shrine although it is possible it may refer to second shrine now lost, that existed at Mohill. Fragments of bone possibly from the saint were found within the shrine. From the sparse references that exist the shrine appears to have been housed near the high alter of St Manchan’s church untill as late as the 17th century. It was later moved to the parish church at Boher where it remained until it was stolen last year. Thankfully the shrine was recovered the next day. St Manchan’s shrine is one of the finest medieval reliquaries to survive in Ireland and its loss would have been significant. St Manchan’s shrine is what is known as a house- shaped shrine and resembles the pitched roof of church or oratory. The shrine is made of yew wood ( 48cm tall by 40 cm wide by 61cm long) and decorated with highly decorated bronze figures and bosses and sits on four feet. The shrine was portable which meant it could be carried in processions. Four metal loops are found at each corner which allowed wooden poles to be treaded through. A reliquary procession may have formed part for the pilgrim rituals on the more important days in the pilgrim calendar such as the saints feast day. It likely that the date of the translation of the saints relics to the shrine would also have been a special day in the pilgrim calendar. In modern times a piscina (a shallow basin placed near the altar of the church used for washing the communion vessels), at the east end of the south wall of St Manchan’s church became a point of modern devotion. Votive offerings such as coins, pins and a small plastic statue of Christ are left behind by modern pilgrims. to which the blind, lame and persons afflicted with other chronic diseases, come on the anniversary of the patrons saint’s death. 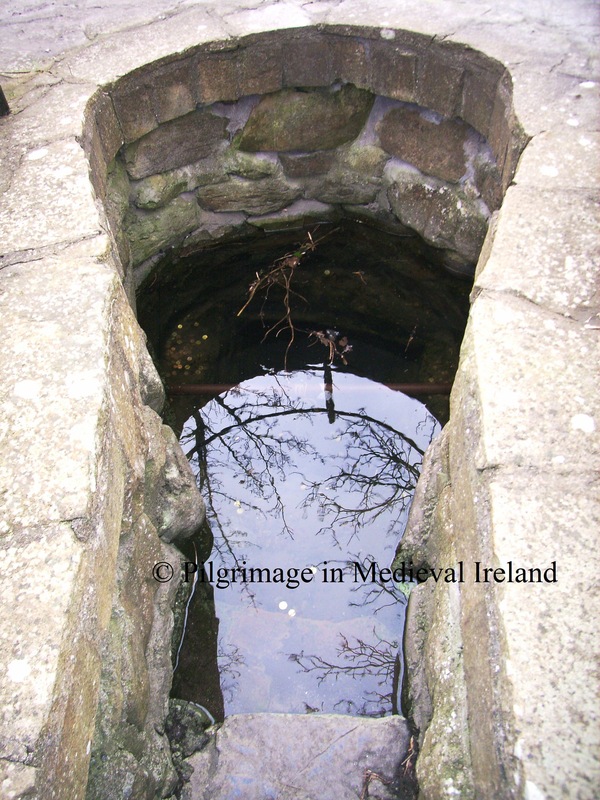 Today only one well holy well remains, it is located close to the main monastery beside the paved causeway that connects the main monastic site with St Mella’s church. A large bullaun stone and rag tree are also associated with the well. 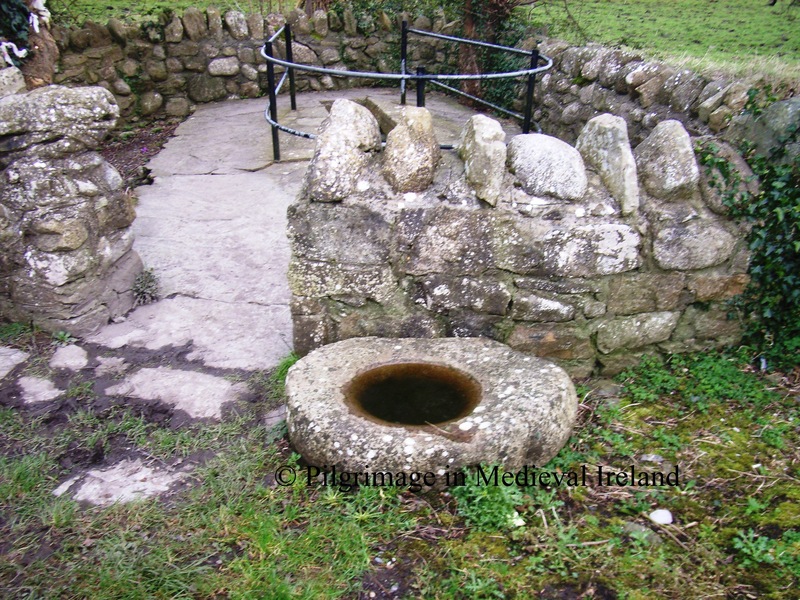 The wells at Lemanaghan may have been a focus of pre-Christian devotion and were christianised when the monastery was founded. The origin legend for the well tells that St Manchan struck a rock with his staff and water poured forth. Another version of the tale states that an existing well was blessed by him. Today people visit the well throughout the year but the 24th of January the saint’s feast day still has a special appeal. The present well, a natural spring, is a product of restoration work carried out during the 1930s. Four grave slabs in upright positions were revealed, set out in a cruciform pattern. The spring is enclosed by a stone wall ( key hole shaped) and accessed by series of steps. The surrounding area has been paved. The base of the well is full of coins left by modern visitors to the well. The waters of the well are reputed to cure nearly every ailment is cured , but particularly neuralgia, cancer and warts. The folklore suggests that for a person to be cured they must apply water to the affected part and walk three times around the well. 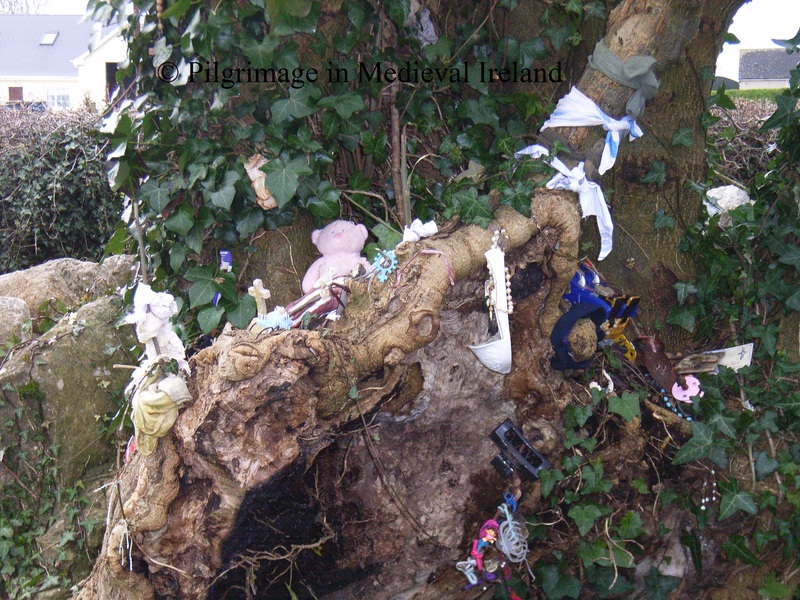 Beside the well is a misshapen ash tree, covered in rags, handkerchief, rosary beads etc. There is local tradition of taking pieces of wood to protect the home. 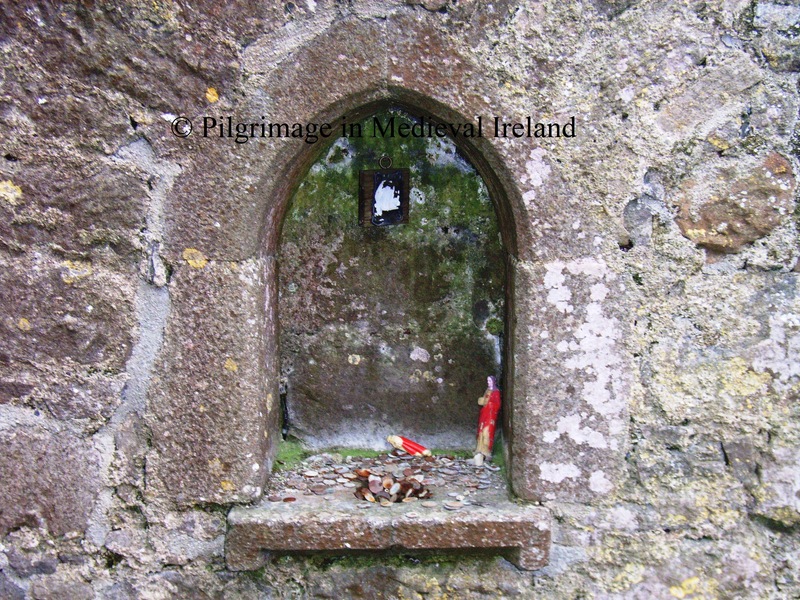 Similar practices occur at other sites church as St Moling’s well at Mullinakill Co Kilkenny, where the wood of the tree beside the well is supposed to protect against fire. Like most sites we can only get a glimpse of the medieval pilgrimage tradition here, through the centuries pilgrimage has continued and adapted to the modern pilgrim landscape which focuses on the piscina within the church and the holy well and rag tree. 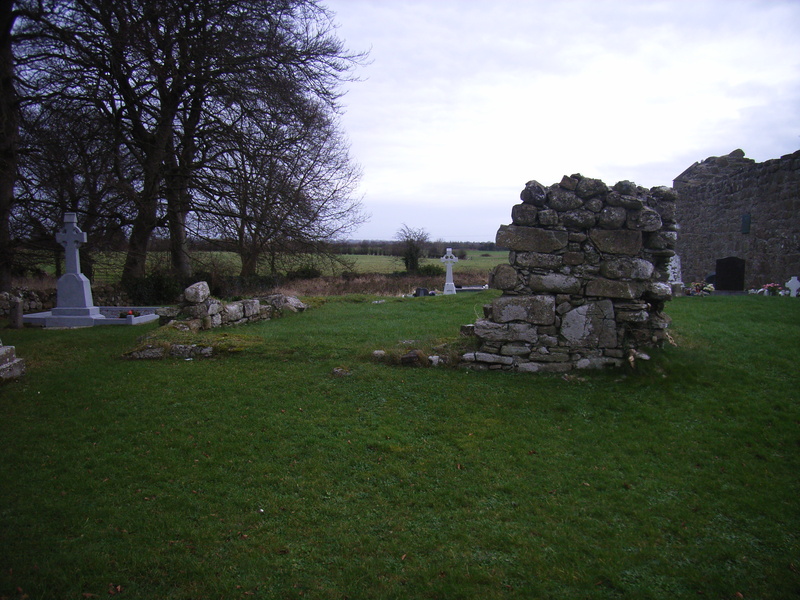 I think Lemanaghan was a pilgrimage site in its own right with St Manchan attracting pilgrims from the locality and beyond but it may have also acted as a secondary shrine for pilgrims enroute to Clonmacnoise & Durrow. If you want to find out more about the site and its history check out the sources listed below. Crawford, H. S. 1911. ‘The early slabs at Leamonaghan, King’s County’, JRSAI, xli, 151-56. De Paor, L. 1998, ‘The Monastic ideal; a poem attributed to St. Manachan’ in Ireland and Europe, 163-169. Fitzpatrick, E. & O’Brien, C. 1998. Medieval churches of County Offaly. Dublin: Government of Ireland. Graves, J.1874, ‘The Church and Shrine of St. Manchan’ JRSAI, xiii , 134-150. Monahan, J. 1886. Records relating to the dioceses of Ardagh and Clonmacnoise. Dublin : M. H. Gill and son. O’Carroll, E. 2001. The Archaeology of Leamonaghan: the Story of an Irish Bog. Dublin. O’Brien, C. & Sweetman, D. P. (eds) 1997. Archaeological Inventory of County Offaly . Dublin : Stationery Office. This entry was posted in Holy Well, Medieval Church, Medieval Monastic Site, Medieval Pilgrimage, Pattern Day, Uncategorized and tagged Lemanaghan, medieval pilgrimage, St Manchan's Holy well, St Manchan's shrine.